I was riding somewhere with a friend when she told me The Tanning Boutique had closed. I was sad to hear it- I’m sad to hear any business closes down because from knowing people who have owned businesses both successfully and unsuccessfully, they put a lot of blood, sweat and tears into making it work. Sometimes it works out, sometimes it doesn’t. I’m always sad to hear when it doesn’t. So when a reader came to me and said that she and other people had bought tanning packages and lotion *after* the date the business was dissolved, I asked for proof. This reader provided it to me and I am sharing this here. I do not do this to pile on to another person’s misfortunes. I am doing this in hopes that these people who have had this happen to them, can perhaps get a resolution. 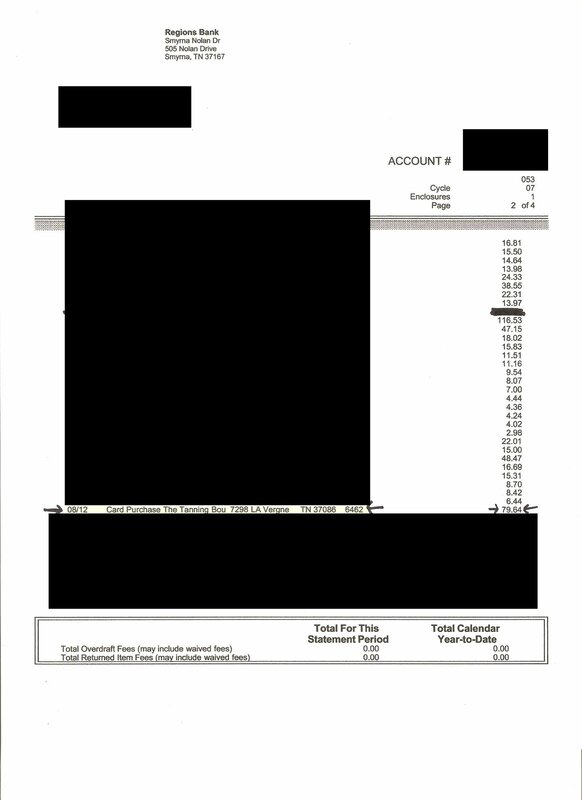 I would like to state here that any local tanning place that would consider giving the reader and anyone else who could produce a receipt or a bank statement, either credit equal to what they paid or even an incredibly sweet deal, would get a post of their own here and I’d also link to them in the links down below. Why should they do this when they have nothing to do with the Tanning Boutique’s closing? Because it’s a nice thing to do and is good PR. So here are the reader’s words and below I will post the copy of the dissolution papers and the reader’s bank statement. I have been in contact with the owner via Facebook and she has stated she will NOT be making refunds. She has also posted this herself on the business’ Facebook page. She states she wasn’t aware she would have to close till they turned off the electricity from lack of payment. I find this insulting to customers, everyone knows when your electric bill is due, when your rent is due. To say her bills were a surprise is insulting. It states on her FB page everything (meaning bills came in to be paid) happened and her closing was in three days time. Unacceptable. If the electric is turned off I believe she would of had warnings of it to happen. She also knew when her rent would be due. She also states on FB there is no money to refund. I purchased a package and pre ordered a lotion (I never received) less than 5 days before she closed. Where did my money go? It obviously wasn’t to pay bills. I am sending a link to the article she posted. It is very personal and persuasive. Till you begin to think logically about how things work in life. I am attaching The Tanning Boutique’s paperwork from the state (available to anyone on the Sec. of State’s website) that shows her business officially with the state dissolved on August 9th. I went into her business on August 10th and made a purchase of 79.64. Her lawyer on the dissolving paperwork shows to be Phillip M. George in Smyrna. I’m attaching my bank statement page that has the transaction. It has a date of 8/12 due to that is the date it cleared my bank. I completely understand about a failing business and losing money. If she had forewarned customers of this happening I would not be upset. But it takes days to file for bankruptcy, file business dissolution papers with the city/state. She knew she would be closing and continued to take money from customers. This is wrong. She stated on Facebook her daughter was working for free, she wasn’t paying the electric or rent. So where is the money she received from customers during that time? And to have her doors opening receiving funds after the state has her business as inactive?!! I am assuming that is not a legal situation; especially since she was receiving funds for future services for a business she already knew to be inactive and was in the process of filing bankruptcy. I should have listened to my gut feelings because on August 10th when I went there I was told there was a plumbing problem and the bathroom was out of order. Now I think it is more likely her water was already shut off. I know this is only speculation on my part. But I feel it is one more check in the column of her lying to customers. Thank you for responding and researching this. It is a great and heart warming feeling to know there are people who will still stand up for what is right. So, that’s what the reader sent me. If anyone can help this reader or anyone else who has lost money, please do so in the comments. Let me say this, however, I do not want this to turn into a big personal attacky dramafest, either against the owner of the Tanning Boutique or the reader who sent this in. I present this here because the reader had facts to back up what she said, and again, in hopes that she and any others who this happened to, might be able to get some resolution. Hot Spot Tanning certainly understands the hardships in running a business. We always hate to see anyone not succeed. Hot Spot started in Rutherford County almost 12 years ago. We have had our share of challenges like every other business in this economy. We obviously cannot refund monies which was spent at one of our competitors. What we can do is offer you special promotions on lotions that will be available only to former Tanning Boutique customers. We also will give you the best possible deals we can. If you allow us to take you on a tour of our salon and explain the benefits of tanning in moderation, you can purchase your choice of any 3 beds for only $9.99. Then we will add our newest bed in for free. The newest Technology is Rejuvenation bulbs and we will give you a free visit to try it out. This is 4 visits with a value of $60.00 for only $9.99. We will also do our best to help you out in any way we can. Come visit us at the Lavernge Old Timers Day Carnival. We will have a special treat for all of you. We are located in the Lavergne Kroger shopping Center and have been here for 7 years. We look forward to seeing you. In the days of the one and done salons, we have been stable, profitable and growing for 12 years. Please remember that you can buy a tan package in any salon and tan in any one of our 8 Rutherford County salons. Thank you for your business because we truly appreciate it!!!!! Wow, thanks! I know zero about tanning and what it costs, but it sure sounds like a good deal! That is sad when a business shuts down, but I had never even heard of this place the only tanning place I know of is Hot Spot. But if she sold people things after her business was supossed to be closed, shouldn’t she by law have to refund the money if people can prove they bought from her after she filed for banckruptcy? Sadly, probably not. Creditors go in order, and customers are usually the very last. If there’s little to no money and it’s truly an incorporation or llc, you’re probably going to see pennies on the dollar, if that. We allow businesses in the US to be treated as their own persons, born with incorporation and dying with judge approved liquidation. They have no next of kin to go after. You’re just out. Sorry. Be glad you’re not out more. That’s not 100% true. The legal system may allow you to take legal action against an individual in a corp/LLC/etc even if the entity has gone bankrupt. As an example look at Enron. Did “Enron” go to prison? No, But Kenneth Lay did (well, he was convicted, I think he actually died before sentencing). I would say it’s a similar thing here – If the business was shut down on day 1, but you were sold goods on day 2, legally you can go after the individual who sold the goods. That’s the legal answer anyway, but realistically you are out of luck. The cost of an attorney alone would exceed your losses, plus you know the old saying you can’t squeeze blood from a rock. Wow, this is pretty sorry. We all hate to see any business close in this city yet to go out on that note by using deception and to later claim little knowledge that things were so bad financially is BS. To continue taking money for services you won’t be able to provide will come back to haunt these people one day, hopefully very soon. The owner(s) owes this individual $79.64 and any additional money that needs to be refunded to others immediately, but I’m afraid this won’t happen. In the meantime, I think taking the other company up on their offers might be the best and only thing this lady and any other people who were denied what they paid for can probably do.I personally think it would be worth more time and effort to spend money on an attorney to get this kind of money back. Let’s just be glad these shady people are no longer in business and cannot rip anyone else off. That is pretty terrible of the owner. What a piece! The lady sold me a year of tanning for $139.00. I said, “Wow! What a great deal! What is the catch?” She responded with, “No catch.” I would say the fact that I just spent $140 on three weeks of tanning, in which I spent another 60 in upgrades alone, is a very big catch. Thank you TANNING BOUTIQUE for making me lose all confidence in Tennessee Tanning Salons, being a new resident of Tennessee. And thank you for making me regret putting half my paycheck in your pocket for three weeks of crappy tanning in broken beds with missing bulbs. I appreciate it. Hot Spot you will be seeing me soon. Just one more thank you-Thank you for also ruining my trust in leaving my lotion at your salon. I will for sure never see that again. Hollywood Tan in Smyrna is actually accepting the contracts that TTB had and your tanning lotions have been turned over to them with your names, etc. I know Ivy talked with Ms. Stephanie today and is writing a post about it, but I did want to let you know that your money is not altogether gone and you can retrieve your tanning lotions. The real question is who is accepting the contracts TBT had? That would be a frickin goldmine, dude. He’s one tan man.